Hairy hubby is thrilled by its advent, in any case. He’s mentioned it twice just since teatime, bless him. Not because he wants another child (although he does), but purely and simply because he knows that barring meteorite-strike, baby disaster (subcategories here include uncontained floods of pee, poo or vomit, soaring high temperatures and successful cot-climbing) or major domestic strife, he’ll get a shag later. I feel that fending him off would be unkind at this late anticipatory stage. Although, our entry into the bedroom last night was met by bright eyes, a beaming smile and unrestrained delight, so the spare room may temporarily have to house us. The thought of youngster peering bemusedly through the cot bars is horribly and shudderingly bad. Perhaps it’s time he migrated to the nursery after all. 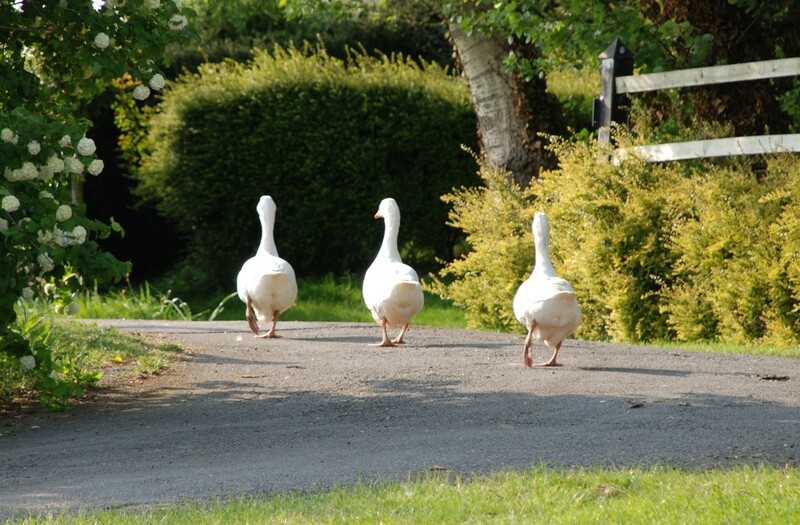 Moving on… but possibly not far enough… I have previously mentioned the worrisome Greek Thing That Should Not Be that has emerged among our geese gaggle. The horror deepened today, when the hitherto androgynous grown-up gosling laid an egg. Indicating firstly that she is female (probably… if not, that egg’s made us rich), secondly, that she is post-pubescent and lastly that she has most likely been, ahem, at it. Given that the males she lives with are her father and her brother, I feel that the situation may have gone far enough. I have tried to find new homes for them amongst my friends without success, abject fear being the main excuse cited in refusal. They’re going to have to go for the choppy-chop, sad though it makes me. If you know anyone in the Warwickshire vicinity who wants a nice goosey guard pet, do apply here. I can vouch for their hissing abilities and handsome looks, but not, alas, for their uncorrupted morals.